Welcome to the world of Machines Of Adventure! What if you can see more than your eyes let you? What if "out of body" experience is something real? What if you don't need to take drugs to experience the world beyond material reality? Yes, you got it right. All the episodes are available for free reading online! Right here. Just click the titles at the upper menu. If you like what you see and you want to see more, you may want to support my work by donation. Thanks in advance! Every dollar will keep me running! Gatthae Island is an interactive VR experience set in the universe of the graphic novel series Machines Of Adventure. It explores the concept of augmented perception beyond given senses, which reveals hidden layers of reality, invisible connections, and the importance of interaction with the world around us. 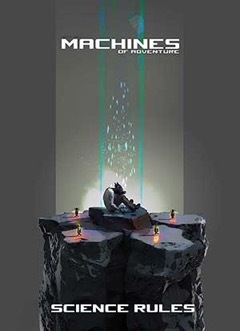 The user will explore the Gatthae island where she/he will learn to interact with various objects until the hidden connections between matter and motion become apparent. Using gestures, moves, and especially combined flow of both will initiate visual manifestation of previously hidden potentialities, and so the user will become able to levitate or to use telekinesis - as was the main hero of the story, thanks to his multi-sensory swarm of drones. For more information, please see Media Section of this web. To dream in 3 Dimensional space, explore a concept, and then create a narrative, without resorting to the clichés of many before, puts this great piece of work, into the stellar league. Wonderfully cinematic, a visual treat filled with amazing designs! 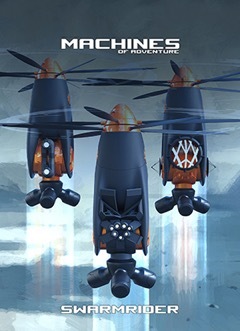 From amazing automotive designs to sleek flying drones, Mike’s unique visual eye for design is now in graphic novel form. Striking designs and dynamic visuals on every page, a great read and wonderful source of inspiration! With his background in transportation design and an unbounded energy for learning and conceptual design, Mike Jelinek has created in “Swarmrider”, a world where creatures, vehicles, machines, characters and epic landscapes all co-exist and he has tied them all together with just a bit of science shrouded in mysterious dark matter. This work enjoys all the benefits of adventure, design and catastrophe to make a delightful read and the imagery to take one into his world where anything is possible. The amount of work it takes to dream up a world like this and then to properly envision it for the rest of us is to be marveled at. There is care in the story, the design process and the details of the concepts. 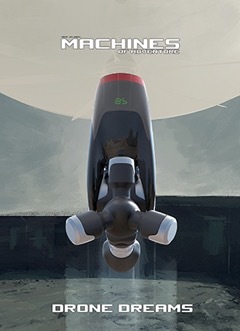 I hope to see a continuation in the “Machines of Adventure” series in future. Fantastic work, I really love the way how you present the process of this project!